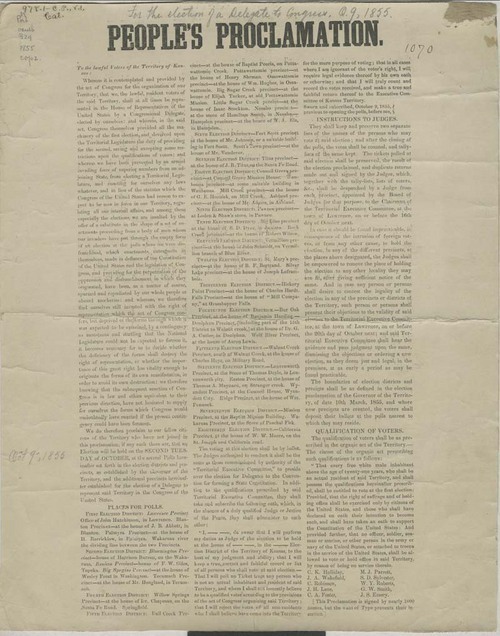 This broadside represented the efforts of free state supporters to encourage residents to vote in the election for the delegate to represent Kansas Territory in Congress that was held October 9, 1855. It listed the polling places, the instructions to judges, and the qualifications for "lawful" voters. This document was probably related to a circular letter signed by Charles Robinson that encouraged free state supporters to see that elections were conducted according to the printed procedures for both the election for delegates to Congress and for delegates to the constitutional convention. The broadside indicated that it had been signed by nearly 1000 persons but space allowed for the printing of the following names only: C. K Holliday, J. A. Wakefield, C. Robinson, J. H. Lane, C. A. Foster, M. J. Parrott, S. D. Sylvester, W. Y. Roberts, G. W. Smith and J. S. Emery. This election was held under the auspices of the Topeka Movement.